The latest reviewed version was checked on 20 June 2017. There is 1 pending change awaiting review. A typical computer has many negative influences on the environment, anywhere from the manufacturing of computers to the distribution of computers. This has caused many questions and awareness among individuals who are concerned with the negative influences on the environment; which may cause hurdles for the new generations to come. 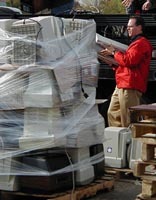 There are various ways one should manufacture, buy, use and dispose computers so the negative impact on the environment can be reduced. E-trash/e-waste is any refuse created by discarded electronic devices and components as well as substances involved in their manufacture or use. E-trash is particularly significant because disposal of electronic items results in toxic waste that is products containing dangerous metals like lead, cadmium and mercury which can contaminate air and water when they are dumped. In some older personal computer monitors, for example, there may be lead in the cathode ray tube (CRT) and soldering compound, mercury in switches and housing, phosphor to the front of a CRT screen, mercury powder in Flat screen backlights and cobalt in steel components. Concern about the environmental issues surrounding e-trash has led governments across the world to implement laws prohibiting its disposal in landfills and issue directives on recycling. In the European Union, for instance, some responsibility was placed back on the manufacturer in the form of directives which make them financially or physically responsible for their equipment at the end of its life (and thereby provide a competitive incentive for companies to design “greener” products). In the United States initiatives mostly come from the private sector, such as eBay’s Rethink project. According to the article, "Electronic Waste: Where does it go and what happens to it", a January 2011 NPR story shows us that companies might not be as honest about what they are doing with your old electronics. More often than not these items are shipped outside of the United States, moving the toxic waste dump from our shores to developing countries, according to Basel Action Network executive director Jim Puckett. The non-profit organization focuses on protecting the environment from dangerous waste. Pucket goes on to say, '“The dirty little secret is that when you take [your electronic waste] to a recycler, instead of throwing it in a trashcan, about 80 percent of that material, very quickly, finds itself on a container ship going to a country like China, Nigeria, India, Vietnam, Pakistan — where very dirty things happen to it,”" Puckett said to NPR. While recyclers do make money selling metal scraps, such as gold and liquid solder, it is cheaper to have the hard labor of pulling apart and melting down pieces done outside the country even if that means the useless scraps and other hazardous materials will liter that area. For example, 60 Minutes went to one of these illegal electronics stripping shops in Guiyu, China, which employed workers for $8 a day. Despite the fumes that made the workers cough and other health hazards, the workers said they opted to work at recycling factories because it was one of the only jobs in this region that paid a living wage. The environmental damage on the area because of all the toxic materials has left a permanent scar. Scientists who have examined Guiyu have determined that because of the waste, the location has the highest levels of cancer-causing dioxins in the world. Pregnant women are six times more likely to suffer a miscarriage, and seven out of ten kids have too much lead in their blood. Many of the devices broken down in the town came from other countries including the US, who in 2008 according to Natural Resources Defense Council Allen Hershkowitz tossed out 130,000 computers each day and dispose of over 100 million cell phones each year. Basel Action Network suggests taking an extra step and using one of the e-Stewards, certified recyclers that do not ship their electronic waste to be disposed of in different countries. It may narrow down the choices of where you can dump your old computer or cell phone, but the extra effort is worth it. Disposal/recycling is a technique used to discard/reuse any unwanted merchandise, in this case computer technology. There are several steps one should take whether the computer equipment is being disposed of or if it is being donated. Deleted files may be recovered from the hard drive and sometimes even a reformatted hard drive. All company information should be removed to prevent hackers from being able to identify where recovered information may have come from. Have the recipient of the used equipment sign that they are accepting responsibility for proper disposal. If the used equipment is brought to a recycling company, request written documentation that they are taking responsibility for proper disposal. If the documentation cannot be provided, this would be a sign that the recycling company is not legitimate. "Studies estimate that 315 - 600 million desktop and laptop computers in the U.S. will soon be obsolete... [and] contain a total of more than 1.2 billion pounds of lead. About 40% of the heavy metals in landfills, including lead, mercury, and cadmium, come from electronic equipment discards." "Informed recycling industry sources estimate that between 50 to 80 percent of the wastes collected for recycling are not recycled domestically at all, but very quickly placed on container ships bound for destinations like China." "Producing the average 55-pound desktop computer and monitor requires 530 pounds of fossil fuels, 50 pounds of chemicals, and 3,330 pounds of water (due to the repeated rinsing necessary). These amounts are roughly the weight of a sport utility vehicle or 1.8 metric tons." "Where once consumers purchased a stereo console or television set with the expectation that it would last for a decade or more... consumers now rarely take broken electronics to a repair shop, as replacement is now often easier and cheaper than repair. The average lifespan of a computer has shrunk from four or five years to two years." "Data from single-day recycling collection events has revealed that more than 50% of turned-in computers are in good working order, but they are discarded nonetheless to make way for the latest technology." "Compumentor research estimates public school need for computers at ... 9 million nationally. This need has been dramatically affected by recent state and local budget cuts." "A significant share of the environmental impacts incurred in the computer life cycle is in the production phase. For a desktop computer used at home, for example, the energy needed to produce the machine is four times more than that needed to power it during the use phase. The energy consumed to produce a refrigerator is only about one-eighth the electricity used to run it." "Over each computer's life cycle, reselling or upgrading computers saves 5 to 20 more energy than recycling." "Research reveals that reselling or upgrading one in ten computers reduces total energy use by 8.6 percent and 5.2 percent, respectively, by reducing demand for new machines. In contrast, recycling the materials from one in ten computers only saves 0.43 percent by replacing demand for virgin materials." "One [obstacle to the re-use of computer equipment] is the issue of the transfer of software licenses for pre-installed software to the purchaser of a used PC. Although a software license is, in principle, transferable to the person buying a used PC, it is often not simpl[e] because the mechanics of the transfer are needlessly awkward." "The E-waste recyling and disposal operations found in China, India, and Pakistan are extremely polluting and likely to be very damaging to human health. Examples include open burning of plastic waste, exposure to toxic solders, river dumping of acids, and widspread general dumping." "Approximately 40% of US families do not have Internet-capable computers." "According to a Carnegie Mellon University study, by 2005 about 680 million PCs will have been sold in the United States since 1981." "...less than a third of the world's population has ever even made a telephone call." Refurbished technology given to the less fortunate. Environmentally friendly as less computer dumping occurs. Ignorant disposal may cause further damage to the environment as harmful elements may be accidentally exposed. Cost involved may discourage correct disposal. So, you’ve decided to do the right thing and take your monitor/computer to a recycling center. What happens after you drop off your equipment? First, many companies or municipalities will separate the equipment into “valuable” equipment (that can refurbished and then either sold or donated) and “non-valuable” equipment (equipment that is too old or in too much disrepair to be salvaged). The monitor is then dis-assembled and the various materials are separated into categories. Glass, plastic, and circuit boards are all collected. Harmful metals are removed from the circuit boards, which are then crushed, melted down, and sold to a manufacturer. Recycling is a good way to reuse raw materials in products, but electronic waste contains harmful chemicals that can harm people and the environment. Developed countries have regulations which control the handling of e-waste, which takes place at specially developed facilities, under controlled conditions. This type of recycling can be expensive, therefore, many developed countries started exporting e-waste to developing countries where recycling is much cheaper. However, these countries do not have laws in place to protect the workers or the environment, which means workers are exposed to lead and other hazardous materials, along with the hazardous effects on the environment, which can potentially harm everyone. Green computing refers to the use of computers in an environmentally friendly way. With the increased use of technology, there is a need to develop energy-saving devices. The US Department of Energy and the Environmental Protection Agency in 1992 created the Energy Star Program. The purpose of the Energy Star Program is to encourage the development of energy-saving devices. Hardware that contains the Energy Star Logo exceeds the minimum federal standards for reduced energy consumption. In other words, green computing involves reducing the electricity and environmental waste while using a computer. Hardware devices should comply with the Energy Star program guidelines. It is encouraged that manufactures create energy-efficient devices. This page was last edited on 1 March 2019, at 14:04.